Portland Lee's Association held their annual picnic at Oaks Amusement Park on Saturday, July 8, 2017 in Picnic Area 4. 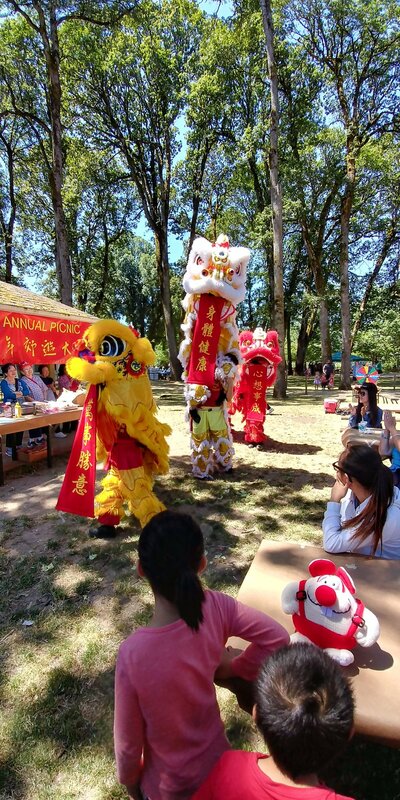 About 110 persons attended the event which began at noon with a Dragon Dance and Lion Dance performed by the Lee's Association Dragon & Lion Dance Team. Food served consisted of Roast Rig, Fried Rice, Chow Mein, Fried Chicken, Hot Dogs, Watermelon and an assortment of desserts and ice cream. There were games for the kids and a spinning prize wheel. Scholarships were awarded to Gloria Saepharn and Brian Lee to help them in their continuing education at Mt. Hood Community College and Portland State University. $250 was awarded to each individual with the funds provided by Franklin and Sherry Quan.